Welcome to our collection of TORn’s hottest topics for the week ending September 2, 2013. If you’ve fallen behind on what’s happening on the Message Boards, here’s a great way to catch up on the highlights. Or if you’re new to TORn and want to enjoy some great conversations, just follow the link to some of our most popular discussions. Watch this space as every weekend we will spotlight the most popular buzz on TORn’s Message Boards. Everyone is welcome, so come on in and join the fun! Members are eagerly watching the number of members at the top of the Message Boards as we inch closer and closer to our 10,000 member. Membership is currently at 9,999, will you be number 10,000? On the Main board this week, Ethel Duath continues to develop the fictional country of Tolkienia. Whilst in the Reading Room, Rembrethil is leading us in discussing the Akallabeth. 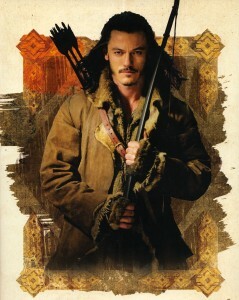 On The Hobbit board Semper Fi is sharing their displeasure over the depiction of Bard the Bowman. And in Off Topic Ethel Duath was shocked to discover she’d wandered onto Valinor. We’ll share more topics next week. We hope you’ll come and join in the conversations! Don’t forget, TheOneRing.net’s message boards has nearly 10,000 registered Tolkien fans, just like you. Let your voice be heard! If you like what we do, and would like to see your Tolkien community keep growing and growing, consider making a contribution to our Pledge Drive. Every bit helps defray our costs!